The RE curriculum is based around the locally agreed syllabus "Living Difference”. This seeks to promote religious, social and racial harmony through respect for difference and diversity. 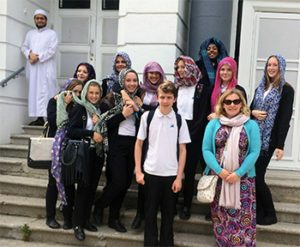 By ensuring that students enquire into, understand and are able to recognise the importance of key concepts within a multi-cultural and multi faith society, they will be able to play an active part in starting to shape the future direction of society. They will be able to communicate effectively, negotiate rights and responsibilities and recognise the importance of taking into account the needs of others in working towards common goals and values, and a shared sense of citizenship. At the same time, this respect for diversity is encouraged through the understanding that we are all different and this is a strength not a weakness of being British. Students take two of the three papers. They each count for 50% of the final mark and last 1hr 45mins. A positive, safe learning environment that encourages the development of their own beliefs and the sharing of their ideas and opinions within a culture of mutual respect and shared responsibility. Be actively engaged in their own learning whilst being challenged and motivated to take responsibility for their own progression. Experience well planned lessons which challenge, provide clear assessment and regular opportunities to express their beliefs as well as enable them to listen to the views of others and those who have views different to their own. Also allowing them to reflect upon their own learning and development.